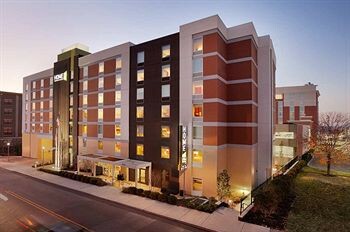 Property Location Located in Nashville (Vanderbilt University - Music Row), Home2 Suites by Hilton Nashville Vanderbilt is minutes from Local Color Gallery and Car Collector&apos;s Hall of Fame. This hotel is within close proximity of Upper Room and Hank Williams Jr. Museum.Rooms Make yourself at home in one of the 119 guestrooms, featuring kitchens with full-sized refrigerators/freezers and microwaves. 42-inch flat-screen televisions with digital programming provide entertainment, while iPod docking stations help you enjoy your music in the comfort of your room.Rec, Spa, Premium Amenities Take advantage of recreation opportunities such as an indoor pool, or other amenities including complimentary wireless Internet access and tour/ticket assistance.Dining Grab a bite from a grocery/convenience store serving guests of Home2 Suites by Hilton Nashville Vanderbilt.Business, Other Amenities Featured amenities include dry cleaning/laundry services, luggage storage, and laundry facilities. Self parking (subject to charges) is available onsite.